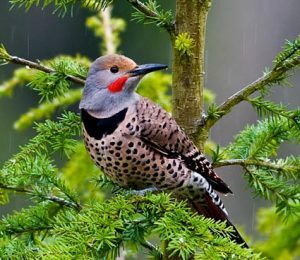 Have you ever been awaken by a woodpecker drumming on your outside gutters, your house siding, or even your satellite dish? Some woodpeckers can be pretty annoying in the early morning hours. And…the damage they can make! In one of my previous posts I mentioned how one particular Northern Flicker did quite the damage to our cedar sided house (at our old home in Ohio). We lived on six and a half acres on a wooded lot so we hand a lot of trees. That woodpecker had drilled holes all over our siding on all sides of the house. It seemed useless trying to fill in the holes and paint over them as the woodpecker would just make a new one somewhere else on the siding. It was very frustrating to say the least. And with all the trees we had you would think that would be enough for them. But to no avail! My husband even tried one of the suggestions from a nature center to put reflective plastic strips over the holes because they were suppose to deter woodpeckers as they don’t like things that are shiny. You see woodpeckers peck holes for nesting purposes we were told and the shiny flags would keep them from coming back to that same hole to make an even bigger hole for their nestlings. When we realized that this crazy idea wasn’t working…after I had what seemed to be about fifty or more little shiny strips all over my house…. I just had to do some research…..
Why Do Woodpeckers Peck Houses Anyway? You would think that with all of the trees out there woodpeckers would be satisfied by just pecking on them right? After all that is where they get their food supply which consists of a diet of mainly insects (they will also eat nuts, berries, seeds, and sap). However, woodpeckers don’t just peck on trees or wood just for a good meal. 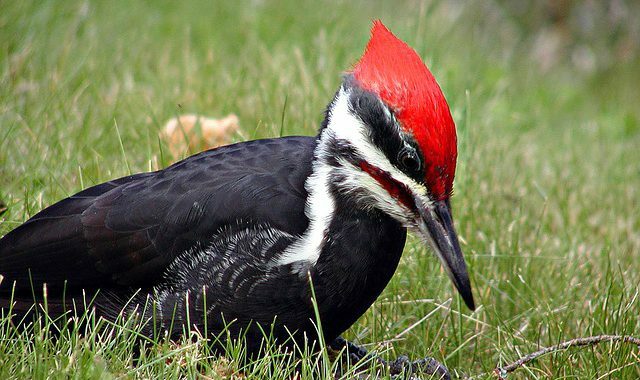 There are other reasons why woodpeckers peck on things. One of which is to defend its territory. The male woodpecker will find the loudest thing to drum on to attract a mate. That could mean anything metal, a pole, or whatever works for the bird. The louder the better, as it gets the female’s attention and tells the other birds to stay away. In addition to that, they tend to return back to the same territory because if it worked before it will work for them again. Another reason is for nest building purposes. Woodpeckers drill holes usually in the cavity of trees but will use your house if nothing else is around for them. This is especially if it has cedar like we had, or redwood siding as they really like these. Barns, telephone poles, or other man-made structures are fair game too. In addition, woodpeckers also peck holes to store food their food to come back for later. They also peck holes for roosting purposes. There are some things that you can try to deter woodpeckers from your yard if they are causing damage. No guarantees mind you but it is definitely worth a shot if you are at your wits end. As mentioned earlier my husband filled the holes made by that Northern Flicker on our house with putty and then painted over it with a stain which happened to be the color of our cedar siding. Yes, they stayed away from that hole but continued on to make a new hole in another spot. You can hang reflective tape or shiny strips up over the holes to deter the woodpecker from coming back to the hole. This does work as the woodpecker will not come back to that one however it just moves on to another spot on your house to start a new hole. As I mentioned from my personal experience earlier. 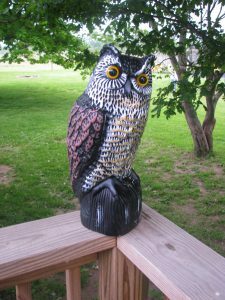 chuckle when I see those plastic owls on roof tops or wherever. They just do not work. You can also add a nesting box for the specific woodpecker coming to your yard. There are woodpecker nesting boxes that you can purchase to nail to a tree or a fence for the woodpeckers to take up residence. Just make sure you buy the correct size as there are different size holes for each species. Also, no guarantees for a woodpecker to use it and other birds such as starlings like to use them too. Woodpeckers make their loud pecking noises during mating season in springtime around April and May. 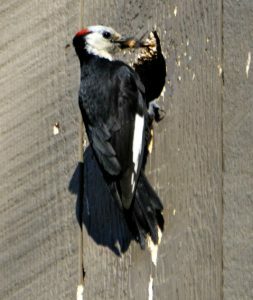 If you have a woodpecker pecking on your house beyond this period and/or throughout the year, it may be because the bird is feeding on bugs such as carpenter ants in your siding. We learned that we had a carpenter ant problem and had our house treated every year after that. That is how we were able to stop the Northern Flicker from any more destruction to our house. If you have tried all of the above and still have problems, just keep in mind that woodpeckers only do their loud drumming in spring time. Eventually it will stop. Woodpeckers peck on houses, barns, metal, or whatever they can find to make the loudest noise because they want are defending their territory and want to attract a mate. 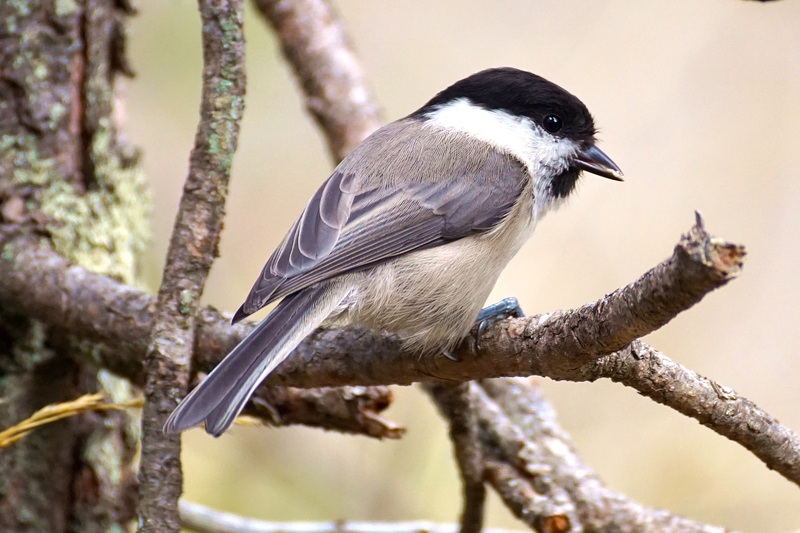 They also peck on wood to satisfy their diet of insects or sap, to make a cavity for nesting, and also for roosting purposes. Unfortunately in the process sometimes they cause damage too. You can try a few things as mentioned earlier to see what works best for you. If a woodpecker is just being annoying in the spring time as it drums on your gutters or satellite dish every morning, just remember it won’t last long. Once it finds a mate it will stop. Do you have any problems with woodpeckers? Have any solutions other than what I have mentioned? Please feel free to comment below. Posted in Backyard Birds, Landscaping For Birds, Woodpeckers. I love your article on woodpeckers! I have several that come around in the spring, but luckily, they have chosen to use the trees I have rather than my house. How awful to have one tearing up a building. I also have never seen a woodpecker birdhouse but they are very nice looking. I know woodpeckers can be very annoying, but they are so beautiful (maybe that’s why lol!) If I have one start pecking on my house, I will certainly invest in a birdhouse. Thanks again! I agree with you….woodpeckers are very beautiful birds and I never mind them hanging around. Really, you don’t need to worry about them causing too much damage unless you have a wood sided house or barn. The noise that they make on gutters and such is just noise. I can handle that! Thanks for your comment!